Cefinet. All infrastructures under control. Cefinet is the system that enables to integrate the supervision of big control rooms and mobile telephony station infrastructures, no matter what their technologies are. A.C. Low Voltage Distribution Boards (Schneider, Alstom, Siemens. ABB, GEFanuc,....). UPS (Merlin Gerin, Enerdata, Cener, Saft,....). AC Power Analyzers (Schneider, Alstom, ABB, Siemens, Satec, Circutor,….). DC Power Converters (Lucent , Emerson,....). DC Power Supply Distribution Boards (Lucent, Emerson,...). Air Conditioning Systems (Hiros, Carrier,...). Fire Detection Systems (Notifier, Cerberus,...). Antiintrusion Systems and IP cameras. Ambient humidity and temperature measure. 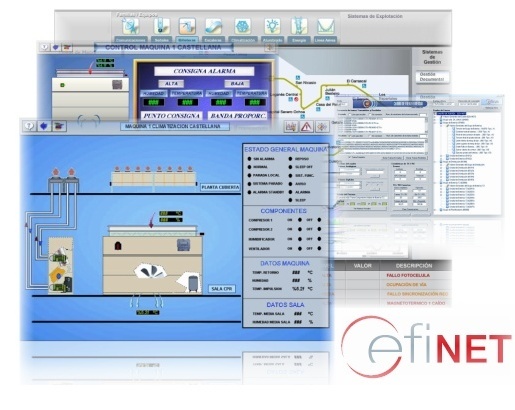 Cefinet is integrated into the customer’s maintenance management system or ERP. The system is able to manage control of access by maintenance personnel to installations and automatic notification of commencement and completion of work orders for on-site maintenance works.